Which Car Seat Do You Need For Your Newborn, Baby Or Child? - Which? Which car seat do you need for your newborn, baby or child? Why do I need a car seat? What's the best baby car seat? What are booster seats, i-Size, Isofix and car seat groups? Get started with our guide to choosing the best car seat. Car seats can be confusing. It feels like there's so much you need to know – and that goes for whether you're a first-time parent or looking for a new car seat because your newborn, baby or child has outgrown theirs. It doesn't help that there's so much jargon: things like Isofix, boosters, i-Size, R44, side-impact protection... and the list goes on. The first thing you need to know is that in the UK all children need to use a car seat from birth until 12 years old (or until they are 135cm tall, whichever they reach first). The car seat you buy needs to meet EU standards, and your child needs to be in the correct category of seat for their age and size. And three things to consider before you hit the shops. For our picks of the best baby and child car seats we've crash tested, visit our child car seat reviews. Read on to find out how much you need to pay to get peace of mind from your car seat, and use our chooser tool to help you get started finding the best car seat. Which newborn or baby car seat? Child car seats are designed to protect children's soft bones and vulnerable internal organs at each stage of development, from birth to the age of 12. Babies need different levels of protection to toddlers and older children, so when you’re buying your first newborn or baby car seat you need to make sure you're getting one that is suitable specifically for newborns and younger babies. To help you with this important decision, our interactive chooser tool below will guide you through the key features and buying decisions to consider when buying your first baby car seat. All babies start off in a rearward-facing infant car seat. 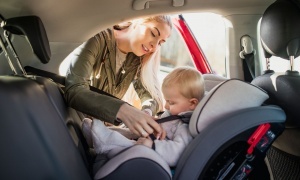 Visit our guide to the best baby car seat to find out more about why travelling backwards is a vital part of preventing injuries in a crash. And see our top 10 baby car seats. Don't wait until your baby is born before you choose – if you're travelling home by car, most hospitals won't discharge you unless you have a newborn car seat. There are some questions you'll need to answer before figuring out which type is best for you - you'll need to decide whether you want an infant carrier that can be used a part of a travel system on a pushchair, and you'll also need to consider whether you want a car seat that can be secured to the car by Isofix connectors, the car seatbelt or a base. You'll find more information on how your car can affect which child car seat is best for you in our guide to factors affecting child car seat fitting. How much do I need to spend on a child car seat? If there's one purchase you should budget for, it's a child car seat. You can spend as little as £20 on a child car seat, or anywhere up to hundreds of pounds. Our advice would be not to scrimp on a car seat: get the best you possibly can. We crash test each car seat we review, and it's very rare that we see a cheap car seat that provides enough protection to become a Best Buy. Many parents don't want to pay hundreds for a first-stage car seat, but a £300 extended rear-facing Best Buy car seat, that will last until your baby is four years old, works out around 20p a day over the lifetime of the seat. Group 2/3 seats can be cheaper and, as your child gets older, they can withstand the force of a crash a bit better, so this is where you can save money but still get a decent high-backed booster seat. An expensive car seat doesn't always guarantee it's the safest option, though, so check out our best child car seats. 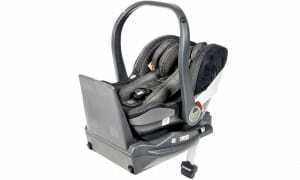 Isofix is designed to make installing your car seat quick and easy. All new vehicles feature the system. You simply click the Isofix connectors on the base of your seat into the Isofix anchor points in the car. These anchor points are metal bar connectors built into the chassis of your car. They are often hidden behind the car's seat padding. Once the Isofix connectors are clicked together, the car seat is secured by a third point – either a support leg that comes built-in into the seat or seat base, or a top tether (a strap that attaches to a mount somewhere behind the rear seat). Both of these work to stop the car seat tipping forward in an accident. Find out more about Isofix, top tether, support legs and Isofit. What are car seat groups? Child car seats are bought in two ways: either according to your child's car seat weight group or according to the height of your child. So Group 0+ is from 0-13kg – that's from birth to about 12-15 months old. It's possible to buy seats that combine one or more groups, for example group 0+/1, 0-18kg, 40-105cm, or from birth to around four-and-a-half years old. These are known as multi-group or combination seats. Find the correct one for you from the different car seat groups. i-Size is part of R129, a new regulation for child car seats that was introduced in 2013. The idea behind i-Size is that all car seats with the i-Size logo will fit in all i-Size approved cars. Your car and your car seat must have Isofix, a fitting system that attaches car seats directly to the frame of your car using connectors. i-Size/R129 seats are based on a child's height (instead of weight). The new seats don't replace the weight-based seats at the moment, they just give you an alternative. Read more about why an i-Size car seat might be best for you. Babies can move up to a forward-facing Group 1 seat when they reach 9kg, but we think this is far too early because their bodies may not be strong enough. It's safer to leave a baby rear-facing until they are at least 13kg or 15 months old. Many parents turn their child forward-facing too soon, risking more severe neck and brain injuries in a crash. Extended rear-facing car seats, that let you keep your child rear-facing until the age of four/18kg/105cm, are becoming more common. Car seat-fitting clinics across the country frequently encounter two-year-old or three-year-old children sitting on booster seats or cushions, which are completely inappropriate for such young children, as they offer such little protection in a side crash. Our guide to the best child car seat for toddlers and older children explains the dangers of moving up through the car seat groups too soon. If you're looking for a swivel baby car seat – that's a car seat with a rotating base – you'll be pleased to know there are now more models than ever that have this feature. Some child car seats have a swivel base to help you put your child into the seat, as you can turn it towards the car's door. Other car seats have a swivel base to make it easier to switch between rearward-facing and forward-facing. Some car seats have a mechanism to stop the car seat being turned forward-facing too early, but others don't. If there is no way to stop the car seat being turned to face forwards too early, it lost marks in our tests because of the potential for misuse. Which car seat fits your car? Finding a child car seat that will fit in your car is crucial, but can be more tricky than you might think. There are several factors that affect fitting – from whether or not your car has Isofix, to how curved your car seats are. If you can, visit a retailer with your car to check that the seat will fit before you buy. Many car-seat manufacturers also have information on their websites (sometimes in a handy fit-finder tool) to show you which cars they know their seats fit in. It's worth noting that a car seat labelled ‘universal’ does not mean it will automatically fit in all cars – there is no such thing as a truly universal car seat that can fit in any car. The label ‘universal’ actually only refers to a seat that can be fitted with a seatbelt (so has potential to be fitted in all cars) or an Isofix seat that has a top tether as well as the usual two anchorage points at the back of the seat (so has potential to be fitted in all Isofix cars). However, other factors, such as the length of your seatbelt and the angle of your seat, will affect which cars these seats really fit in. So it's important that you always check that a car seat fits in your car, and any others you will use it in. Use our child car seat reviews to compare features and prices to find out which seats you might be interested in buying. Make a list of the cars you might use the seat in – for example the grandparents' car, as well as your own. Find out whether the seat will fit in the cars you'll be using – check with the seat manufacturer and the car manufacturer for compatibility. Visit the seat manufacturer's website (or call the manufacturer) to check if it has information about whether its seats should fit in your car. You'll find the manufacturer's website details on the technical specification tab of all our child car seat reviews. Halfords, Mothercare or independents for your car seat? Now you've chosen your baby or child car seat, it's time to head to the shops. Finding a good retailer to advise you on your child car seat is just as important as doing your research, as you want a store that will help you fit your child car seat properly. Look for a shop that sells the car seats you're still interested in. Many retailers, such as independent nursery shops, Mothercare, Halfords and Mamas & Papas, have advisers on hand to help you choose the right one. Arrange for an appointment to check whether these seats will fit in your car and other cars that you use regularly. A qualified fitter might not be available if you turn up out of the blue. Even if your child isn't born yet, try the seat in your car anyway. Watch our videos showing you how to fit a child car seat properly. Ask your retailer to provide a demonstration of the seat's features, how to make adjustments and how to fit it in your car. Read the instruction booklet and keep it safe. You'll need to refer to it when you need to make adjustments as your child grows. Check out our photo gallery of signs that your child car seat is wrong for your child or your car. Check your seat before each journey to make sure it's installed firmly and is adjusted to suit the height of your child. Second-hand car seats will have wear and tear that could affect the safety protection for your child. The harness, for example, could have been cleaned with harsh chemicals that can make the fabric deteriorate, or the seat could have been involved in a crash and weakened. These are things you cannot tell just by looking at the seat. It's not worth the risk. Older seats may not comply with the latest safety regulations, or have gone through updated safety tests, or might be missing the instruction booklet that tells you how to install and adjust the seat safely. These tips will get you started, but for more advice on what to do before you buy, visit our guide on how to buy the best child car seat.